Not only is the notion of a polarized mind explored but the author reveals the unraveling of a spiritual journey which all along was disguised as a physical experience i.e. the bipolar experience. The nature of bipolar is one of contrasts – the light must follow the darkness, and the darkness chases the light. A conceptual look at this constantly waged battle is presented and leaves the reader with a sense that we are all consumed by a battle and we are all on a spiritual journey – the interpretation is however up to you. D.D. was born into a South African Portuguese Catholic family in 1973 on an early autumn’s day in mid April just as the seasons were changing and Cape Town was getting ready for its rainy, cold, winter season. It was a detrimental year for the country as African and Arab states imposed an oil embargo on South Africa, making a stand against its (then) Apartheid government. However, the big news on D.D.’s first day of life came from abroad: The British House of Commons voted against restoring capital punishment by a margin of 142 votes. Interesting times were ahead, not only for South Africa and the UK, but especially for D.D. The bipolar mood disorder that this book is written about only became apparent in D.D.’s life at the turn of the millennium. Although a bit quirky as a child and teenager, D.D. never knew she was harbouring a mental illness. Due to many adverse life events, a debilitating mental condition manifested itself and brought a stark, forbidding reality to D.D.’s existence. 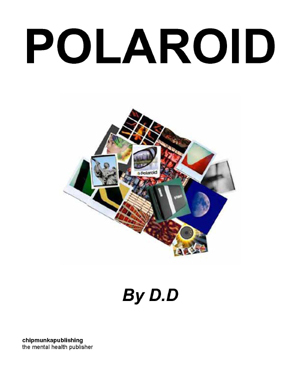 This book is an account of how D.D. confronted this reality and, with a lot of soul searching and support, managed to transform it. Her struggle for acceptance and understanding will never completely go away, but her struggle for peace of mind thankfully did. As I fill the space between the blank lines of this page, so I begin to fill the space in the chasm of my life. It’s the Polaroid life I have been tasked with. A duality of the ecstasy and the agony: conflicting opposites fighting for dominance. I have often wondered how great musicians create their earth-moving music scores. I have tried musical expression many times over – and yet now a story seems more tangible, more methodical, and infinitely more lyrical. My choice of words and language over crotchets and quavers is the new medium I will use to portray the melody of my heart. And so here is my first attempt at what will hopefully be my completed music score, but this time serving the eyes instead of the ears. Music is the universal language but the pen is mightier than the sword and hence the reason for such a manuscript. Through documenting this I make the flux of emotional extremes more solid and rooted, able to withstand the violence of my troubled mind. Thus if I can leave you with one message from my written word it would be this; when the pain of adversity strikes find comfort in knowing you have the wisdom of a Sage and the strength of a Hero to get you through it – these extensions of your being will prevail. Trust the process, trust yourself. Henceforth is my wisdom and encouragement to discover the hero within you, as I did, and many other sufferers before me. We are all given some kind of gift when we come into this world. Some of us have discovered ours and some not. I discovered mine when I was two years old and I have been at war with it ever since: my mind. This “gift” has brought much colour to my thirty-something year existence and much turbulence to my soul, but it is still just that: A “gift”. A mental disorder should hardly be thought of as that. Not by anyone who is remotely realistic. But then, well I guess that’s just it, I have never been completely realistic. My sense of reality has always formed part of my imagination – there is no differentiation between the two. My lecturers used to pick me out for the lack of structure in my assignments. I guess a disordered mind meant a difficult paper to mark. But just this once, I will endeavour to give a particular attempt at structure. For this, my pilgrimage to the Mecca of my internal world, a spiritual process of ‘seek’ and ‘find’. I sought acceptance, purity and hope, and within these pages, I found it. It is said that through pain comes higher consciousness and only through death can one be reborn. The bipolar experience is one of those examples of how the mystical nature of the mind can create an alternative reality through which one can discover a great many things, and feel what it is like to live and die all at the same time.